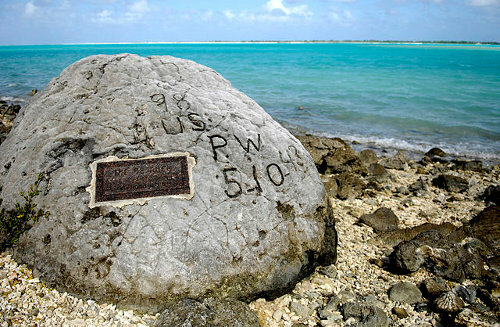 When Japanese forces took Wake Island in December 1941, they put 98 captured Americans to forced labor. When the American military threatened to retake the island in October 1943, the Japanese took these civilians to the north end of the island, blindfolded them, and executed them by machine gun. One of the Americans somehow escaped this massacre and fled. We know this because he returned to the scene and carved the legend “98 US PW 5-10-43” on a coral rock near the mass grave. He was subsequently captured and beheaded. The rock remains a landmark on the island. The American’s identity has never been discovered. 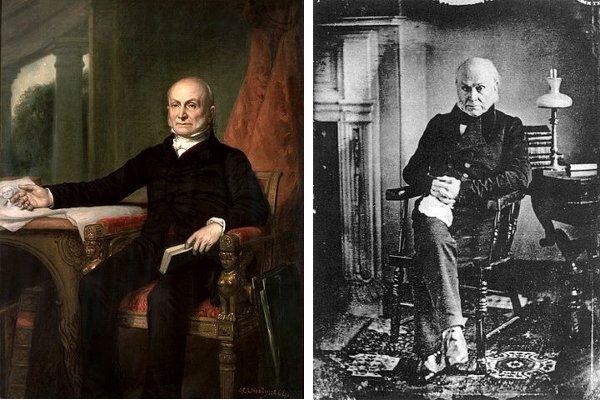 At left is the official White House portrait of John Quincy Adams, painted by George Peter Alexander Healy. At right is a daguerreotype of Adams in 1843, when he became the first president to be photographed. 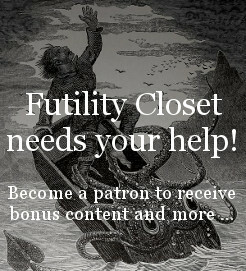 In 1855, American whaler James Buddington came across an abandoned vessel stuck in the ice off Baffin Island in northeastern Canada. 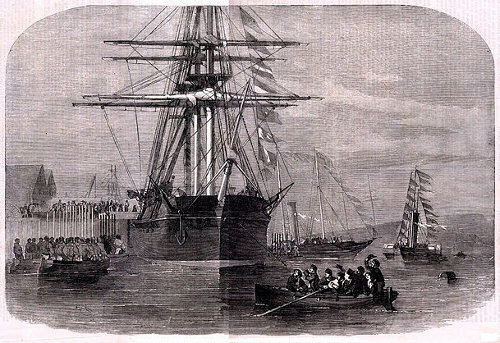 It was HMS Resolute, a British exploration ship that had been abandoned two years earlier and drifted rudderless through 1200 miles of the Canadian Arctic. 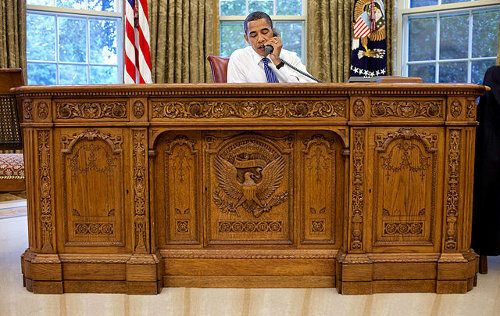 The U.S. Congress returned the ship to Queen Victoria, and in 1879 its timbers were made into two desks with admirable pedigrees: One resides in Buckingham Palace … and the other is in the Oval Office, where it’s been used by almost every president since Rutherford B. Hayes. Pennsylvania dentist Lytle S. Adams had a bright idea in 1942: Since Japanese cities were largely built of paper, bamboo, and other flammable materials, they could be disrupted effectively with fire. And a novel way to spread fire in public buildings would be to release bats bearing incendiary devices. Rigged bats dropped over an industrial city would roost in the buildings as living time bombs, and the resulting fires would spread chaos over a wide area. Surprisingly, the government liked the idea, and it set about designing a bomblike canister in which a thousand bats could be dropped from an altitude of 5,000 feet. At 1,000 feet the container would open, releasing the bats over a wide area. Ten bombers carrying 100 canisters each could unleash a million intelligent bombs over the industrial cities of Osaka Bay. 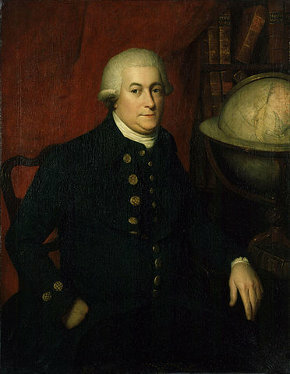 Each year on the last Saturday in April, the citizens of Ocean Shores, Washington, celebrate “Undiscovery Day” to commemorate the night in 1792 when British explorer George Vancouver sailed right past their harbor without discovering it. In July 1945, a former inhabitant of Poland’s Lódz ghetto, Avraham Benkel, returned to find his home in ruins. 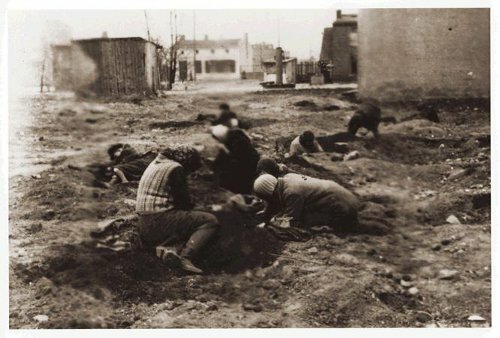 Lódz had been the last of 200 ghettos in German-occupied Poland, and as the war neared its conclusion tens of thousands of its inhabitants had been deported to death camps. When the Red Army reached it in January, only 877 survivors remained. Almost nothing is known about the boy’s identity, age, background, schooling, or fate. Only the verb forms in his entries tell us that he was male. In all likelihood he was deported to Auschwitz as the Russians closed in. 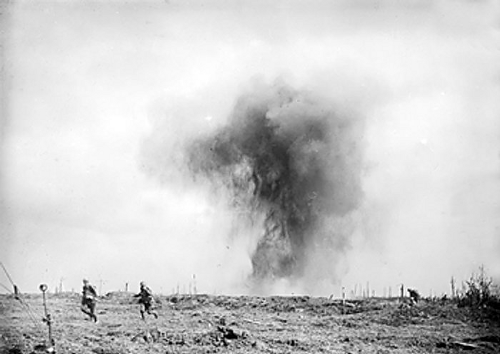 It was about this time that I suddenly realised that I had become acclimatised to shell fire; not that I liked or had ceased to fear it, but that I was able to discriminate between a shell that was coming near and one that was far enough away not to worry about. Some officers recently arrived from England were responsible. They were in charge of one of the working parties, and while we were standing in a group, not far from Plug Street, we heard the whine of a German shell. I looked instinctively in the direction of the church to see the usual cloud of dust and stones, and at the same time I realised that the officers with me had ducked. I was certainly no braver than they were — quite the contrary; but my ear had somehow become attuned, so that as soon as the first sound was heard I knew approximately where the shell would burst. 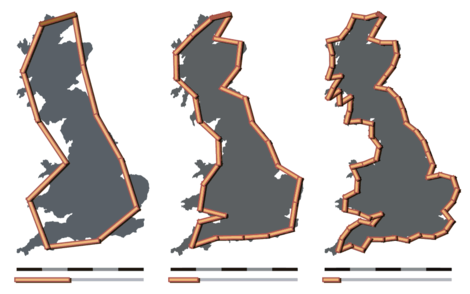 How long is a coastline? If we measure with a long yardstick, we get one answer, but as we shorten the scale the total length goes up. For certain mathematical shapes, indeed, it goes up without limit. English mathematician Lewis Fry Richardson discovered this perplexing result in the early 20th century while examining the relationship between the lengths of national boundaries and the likelihood of war. If the Spanish claim that the length of their border with Portugal is 987 km, and the Portuguese say it’s 1,214 km, who’s right? The ambiguity arises because a wiggly boundary occupies a fractional dimension — it’s something between a line and a surface. This is a mathematical notion, but it’s also a practical problem. On the fjord-addled panhandle of Alaska, the boundary with British Columbia was originally defined as “formed by a line parallel to the winding of the coast.” Who gets to define that? On the map below, the United States claimed the blue border, Canada wanted the red one, and British Columbia claimed the green. The yellow border was arbitrated in 1903. In April 1819 the French slave ship Rodeur set sail for Guadeloupe from the Bight of Biafra with a crew of 22 men and 162 slaves. After 15 days, a disease of the eyes appeared among the slaves in the hold. The heartless captain threw 36 slaves overboard, but the illness soon spread to the crew, and eventually everyone on board except for a single man was blind. And then came one of the most remarkable incidents in the history of sea commerce. As the Rodeur was crawling along with this one man at the helm, another ship, with all sails set, was seen. That was a glad moment on the Rodeur, and she was quickly headed for the stranger, hoping to get men who could navigate the ship. 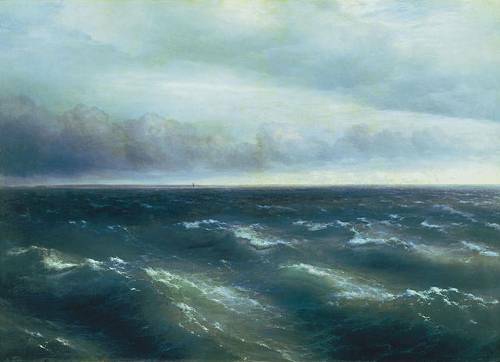 Drawing near, the Rodeur’s lone helmsman observed that the stranger was steering wildly, and that no one could be seen on board. But the moment the Rodeur had arrived within hailing distance men came to the stranger’s rail, and in frantic tones said that every one on board had become blind, and begged for the help that the Rodeur had come to secure. The stranger was the Spanish slaver Leon. Unable to help one another, the two ships parted. On June 21 the Rodeur reached Guadaloupe, where the last man went blind. The Leon passed into the Atlantic and was never seen again.